The Austin 7 Enthusiast Group caters for the member who has or has an interest in the pre-war Austin 7 that is your traditional baby Austin in its many guises. These gatherings are convened by David Grear and commence at 7.30pm on the fourth Monday of each month from February to November. (check the Coming Events page for the next meeting dates). The gatherings are of an informal nature with no minutes taken, the aim is for members to discuss, learn, and impart knowledge in getting the most out of the Austin 7 and importantly your Austin 7. Each gathering usually features an Austin 7 on display with its owner giving a run down on the vehicle. Members with other pre-war vehicles are also most welcome as many of the topics discussed are just as valid on other cars. 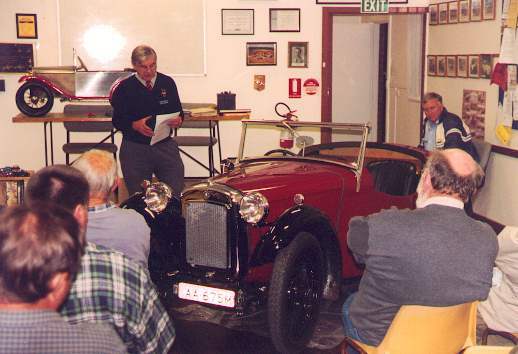 Stan speaking to the group on the finer points of the Austin 7. If you have an Austin 7 or would like to own an Austin 7 please come along to these gatherings and join in. While these evenings are called the “Austin 7 Enthusiast Group”, the gathering includes any pre-war vehicle that any member has, so please come along and join in. Please check the Coming Events page for the next meeting.